When I was 30 and living in Oxford I advertised in the local Daily Info online small ads to meet a man. A plethora of 55-year olds duly responded. One was a mediaeval music scholar from one of the colleges, *Jeremy. We had a few coffee and antiquarian bookshop dates, mainly because I was too polite to decline. He was a dry man of tweed suit and indeterminate sexuality, probably put up to it by an elderly widowed mother, but had the slightly intriguing air of a John Le Carre character. Perhaps the aspect which most stood out about him was a surprising admission that he loved Ken Dodd and booked up to a year in advance for tickets as soon as each Oxford date was announced. Oxbridge-educated *Jeremy simply couldn't get enough of Liverpudlian Ken Dodd and his fabled 5-hour shows and had even made pilgrimages to other cities to see him inbetweentimes to get a top up of the Diddy Men and their master. He would have taken me to the next show, but naturally, it was already sold out. I thought of how devastated *Jeremy must be at the news earlier this week. 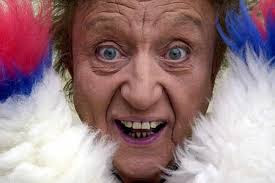 I didn't really consider Ken Dodd to be my brand of humour, but more than one person has enthused that one live show and you were a lifelong convert! Watching the tributes on TV, I found myself acquiring an increasing admiration for the man as I watched interviewee after interviewee marvel at how he shuffled onto the stage as an 89 year old, to become progressively younger in front of their very eyes until they were watching a 35 year old five hours later, their sides hurting from so much laughter, and bursting to go to the loo as he made them wait hours for each break. If performing bestowed upon him the miracle of eternal youth, no wonder he was so addicted to it! I know from personal experience, performing gives an adrenalin buzz like few other activities, though whether this is the same as, say, skydiving, I am not about to find out! Moreover, in direct interviews with Ken, he spoke of 'giving a gift' to the audience, polished over many years, He genuinely saw himself as a gift, giving the gift of laughter to thousands of people. And thousands of people, it seemed, did not disagree. He defied the natural laws of comedy, outliving the rest of the music hall business by a good 50 years (even Max Miller complained music hall had died in around 1950, reckoning he was the last one left 'There'll never be another!' before he died in 1963). Most of Ken's jokes and songs would not have been out of place in the 1940s and his whole act including bad ventriloquism with Dickie Mint embodied a defiant Dunkirk spirit (defiant as in refusing to acknowledge that this epoch in history was long over) and pretending that we were still all British, albeit without alienating those who weren't. In lieu of swearing he invented his own 'tattyfilarious' language for emphasis and point making, not to mention an entire fantasy world of jam butty mines and diddy men based around his home village, the divinely named 'Knotty Ash'. Despite never having had a mother-in-law (just two long-suffering fiancees), Ken also had an endless appetite for that old British staple - the mother-in-law joke. Ken's most up to date references revolved around being done by the tax man in 1989, joking that he 'invented self-assessment' and that he was excused from the Inland Revenue as he 'lived by the sea'. Extraordinarily, for someone who was rumoured to have thousands buried under his floorboards, Ken never got burgled, despite his close proximity to Liverpool, which is a measure of what a local hero he was. Extraordinarily too, he lived in the same modest house he was born in for his entire life, retaining his parents' furniture and table settings and eschewing fancy holidays and cars (though he often had to pay theatres extra for allowing his shows to overrun - and he kept up an exhausting schedule of up to 200 a year). Ken fully played up to his goofy appearance, though looked increasingly marionette-like in later years with pronounced make up to match. In his 50s, a dentist apparently offered to straighten his trademark protruding teeth, much to Ken's outrage. Well Ken, what an extraordinary man you were - yet never a whiff of scandal about you (except for the time you fell foul of the tax man), and you survived the slaughter of the old-style comic when 'alternative comedy' came along. But even in your day, it was unheard of to have a music hall career spanning over 70 years and I think in death you will continue to hold that British record unchallenged. You may even have, single-handedly, been keeping the genre going! And unlike most comedians, you appeared to be a genuinely happy man. Your 'tears of a clown' were happy tears. *Previous posting on Max Miller and George Formby here. What a lovely tribute - I have learnt a lot about Doddy this week that I had not previously known. One of a kind and there will never be another. And here I was thinking he had married his long-term partner for romantic reasons. Of course you are right, it was probably to make the tax man wait for a while yet. Brilliant this has me laughing as much as Ken Dodd. And I'd love to hear more about the plethora of 55 year olds. Thanks for your lovely comments Alyson. Yes, it was a bit unfair to make his fiancee of 40 years wait so long to become Lady Dodd, aside from any tax issues. Plus she sold his merchandise in the foyer at all his shows for years on end! Thanks for your lovely comments too Katrina. Absolutely nothing happened with plethora of 55 year olds beyond coffee and cake on a weekend afternoon in various town cafes. I would always meet them on neutral territory in the daylight and at a time when I could reasonably get away after an hour or two because I had something else in the evening!